Australia qualified for their seventh world cup final today after a convincing win against defending champions India. The win enabled Australia to qualify for the finals for the first time since 2007. 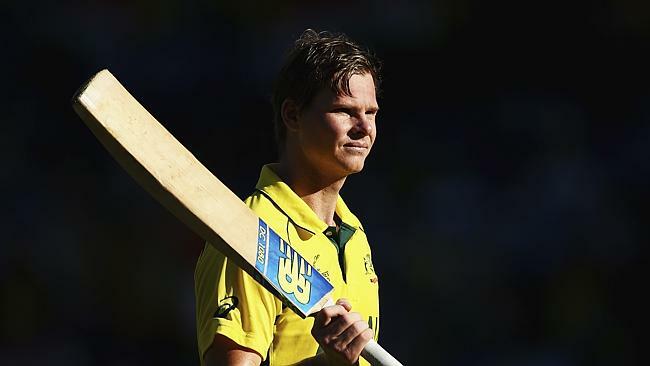 Steve Smith’s 93-ball 105 along with Finch’s 81 and quick-fire runs from Faulkner, Watson and Johnson in the death overs helped Aussies to post a total of 328/7. Australian pacers bowled beautifully, keeping the Indian batsmen under control as they ran out of gas, succumbing to defeat after an 11 match unbeaten run. Earlier in the day, Australia won the toss and elected to bat first. They lost an early wicket of Warner(12) after Kohli took the catch at cover. Australia retaliated as Smith and Finch scored 182 in the 2nd wicket and accelerated the run rate. Smith(105) scored his maiden ton in the world cup, hitting 11 fours and two sixes before being dismissed in the 35th over by Yadav, after Sharma’s catch at deep square leg. Maxwell hit three boundaries and a six, reaching 23 before Ashwin dismissed him. India clawed back into the match as Yadav dismissed Finch(81) in the 39th over and Sharma dismissed Clarke in the 43rd over. Australia were 250/5 after 43 overs. Faulkner hit 21 from just 12 balls, courtesy to three boundaries and a six before being bowled by Yadav. Rahane’s catch at deep square leg from Sharma’s ball also sent Watson(28) back to the pavilion. However, Johnson’s mini tornado of four boundaries and a six from just 9 deliveries helped Australia to finish their innings at 328/7! Yadav picked up 4 wickets giving away 72 runs in 9 overs. India started the chase well, scoring 76 in 13 overs courtesy to Dhawan’s 45 from 57 balls. He hit six boundaries and a six before Maxwell took his catch at deep extra cover from Hazlewood’s ball. Australia regained control as Johnson dismissed Kohli(1) after Haddin’s catch in the 16th over and bowled Sharma(34) in the 18th over. Haddin’s superb catch behind the stumps from Johnson’s delivery also removed Raina(7) from the crease! 108/4 after 23 overs and India were in trouble! Rahane and Dhoni added 70 runs in the 5th wicket partnership before Australia rolled the dice, asking for a review as Starc’s delivery slid past the outside edge of Rahane’s bat straight into Haddin’s gloves. The dismissal of Rahane(44) turned the tide into Australia’s favor. Jadeja was run out in the 42nd over after a brilliant direct hit of Smith from backward point. Dhoni scored 65 hitting three boundaries and two sixes before a superb direct hit from Maxwell dislodged the stumps, bringing an end to his innings. His dismissal ended the last ray of hope India had of winning the contest. Faulkner bowled Ashwin and Sharma from two consecutive balls in the 46th over and Starc bowled Yadav in the 47th over, as India were all out scoring only 233. Faulkner picked up 3 wickets from 9 overs, giving away 59 runs! During the presentation ceremony, man of the match Smith said that the team believed 330 runs to be around par and with good bowling and fielding, they could win the game. He remarked that the review of Rahane was a key moment during their bowling as he and Maxwell both thought that the ball hit the willow. Indian skipper Dhoni complimented Aussies for their performance and said that they started the chase well until Australia got the reverse swing going. Australian skipper Clarke remarked that he was proud of the execution of his bowlers besides praising the Indian team for their performance in the game as well as throughout the summer. Clarke said that the defeat against Kiwis in the group stage was a reality check for his side and everybody learned from their mistakes. He requested the fans to be at MCG on Sunday to support the team! Thus, Australia won the semifinal by 95 runs and qualified for the finals. They will face New Zealand in the first ever Trans-Tasmania final in the world cup history on March 29 at the MCG. Australia will aim for their 5th world cup victory whereas the Kiwis look forward to winning their maiden world cup trophy. Here is to hoping that the final will be an epic encounter just like their group stage clash and the best team will emerge as the world champions!